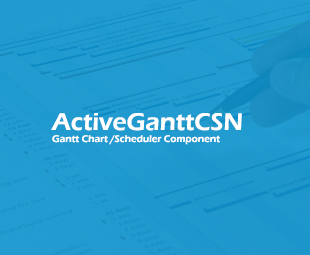 ActiveGanttCSN is a Gantt Chart / Scheduler Windows Forms control that you can use to add advanced Gantt chart or scheduling capabilities to your .NET Windows Forms application . ActiveGanttCSN is written in C#. ActiveGantt can support duration based tasks. Duration based tasks can skip over non-working periods (TimeBlock objects). An easy to use Gantt chart component. Easy to understand object hierarchy. The object model is consistent across all language versions of the component (ActiveGanttVC, ActiveGanttVBN, etc. ), so there is no need to learn a new object model when switching language versions or project types. The Gantt chart component also has additional XML import and export methods so that you can easily persist the data and format information onto a disk or a database. The Gantt chart has snap to grid capabilities and fully customizable tool tips for easy date selection or retrieving task information. Conflict detection can be turned on or off. Items can be arranged in multiple layers. Infinite levels of zoom in the timeline. Timeline is completely customizable. The control supports supports dates with up to millisecond accuracy. Complete color and font customization. The control is fully skinnable. Backgrounds can be gradients, hatches or solid colors and can include images. Available in a compiled state or in professional and easy to understand source code. All trademarks are property of their respective holders, and are only used to directly describe the products and services being provided. Their use in no way indicates any relationship or endorsement between The Source Code Store LLC and the holders of said trademarks.